Love is in the galaxy this Valentine’s Day. 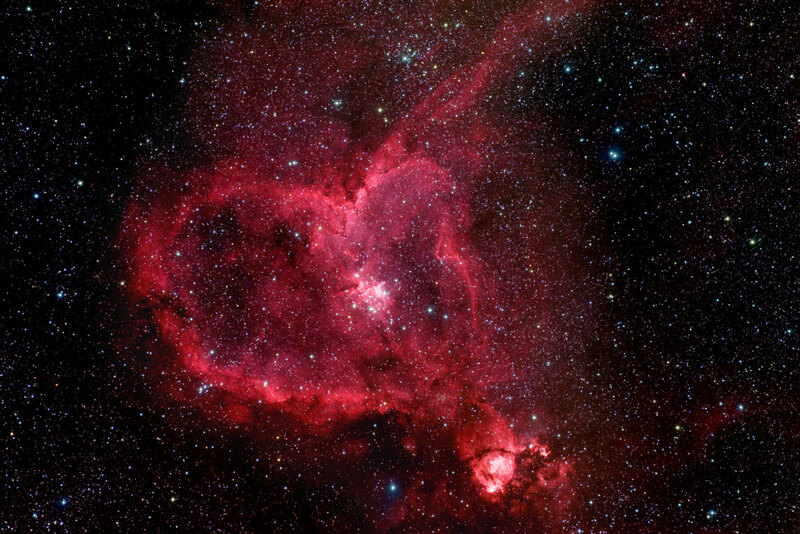 In this telescope image enhanced by artist Rick Wiggins, the Heart Nebula, aka IC 1805, shows off its cosmic clouds. This emissions nebula was created by ultra-violet light, which ionized hydrogen atoms within the nebula into swirling stellar gas, creating a loving home for new stars to be born. The Heart Nebula is located 7,500 light years away in the constellation Cassiopeia, which can be viewed in the northern sky. Cassiopeia was named after the queen in Greek mythology, who oddly enough was very self-involved — quite the opposite of this nurturing nebula. A large cluster of infant stars, known as Melotte 15, beats in the center of the heart. Some of these starts are 50 times the mass of the sun. The most luminous stars in the cluster are called blue giants because they have a hydrogen core. Melotte 15 emits massive amounts of radiation and heat, forming the molecular cloud surrounding it. The cluster is also classified as an open cluster because the stars are not bound together by strong gravitational force. They are “loose” and will eventually drift from each other as the tides of the Milky Way pull them apart. Another interesting characteristic of this nebula is the notch at the end. The notch is called a globule that absorbs a lot of the gas and heat coming off the nebula to form a highly concentrated formation. The globule may one day become a second-star nursery and continue the cycle of life for stars in this region. Talk about an eternal love.